Parallel flange channel is normally called a channel or a “C-section”. They are described by their depth, width and weight per metre in kilograms, eg. 150 x 75 x 18 PFC. 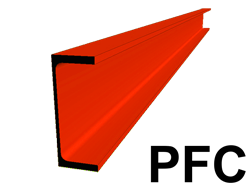 The PFC is used for columns, lintels above doors or simply a beam supporting floor joists. When used for lintels, they have a bottom plate welded to it that takes the outer bricks or 2 channels are bolted back to back with 100 mm spacers to support both leafs of a cavity wall.